The e-education project in Institute of Innovation Research, hitotsubashi University receives the 9th Japanese e-Learning Awards for international contribution in 2012 by e-learning awards forum committee and Fuji Sankei Bbusiness i. 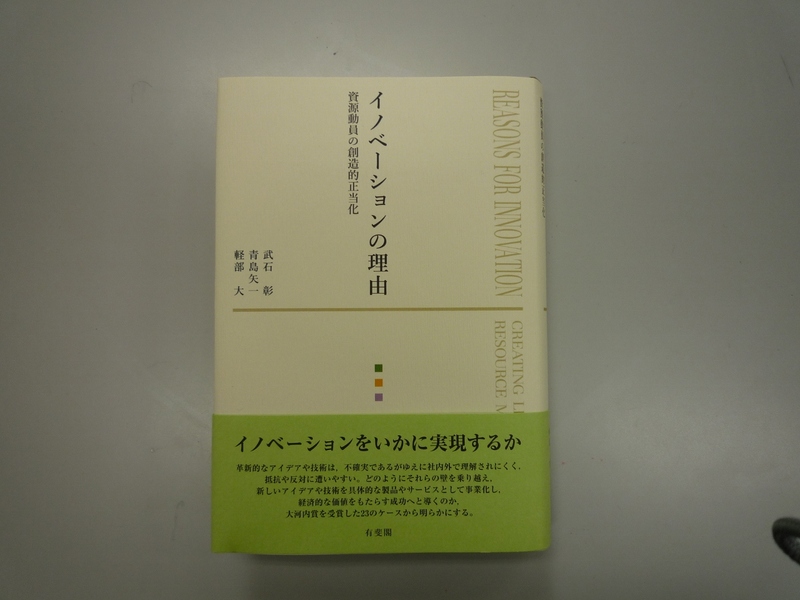 Professor Yaichi Aoshima and Associate Professor Masaru Karube of the Institute of Innovation Research have received the 55th Nikkei Prize for Excellent Books in Economic Science for their book. Every year the prize is awarded to outstanding books that have been published in the past year in the fields of economics, management and accounting. 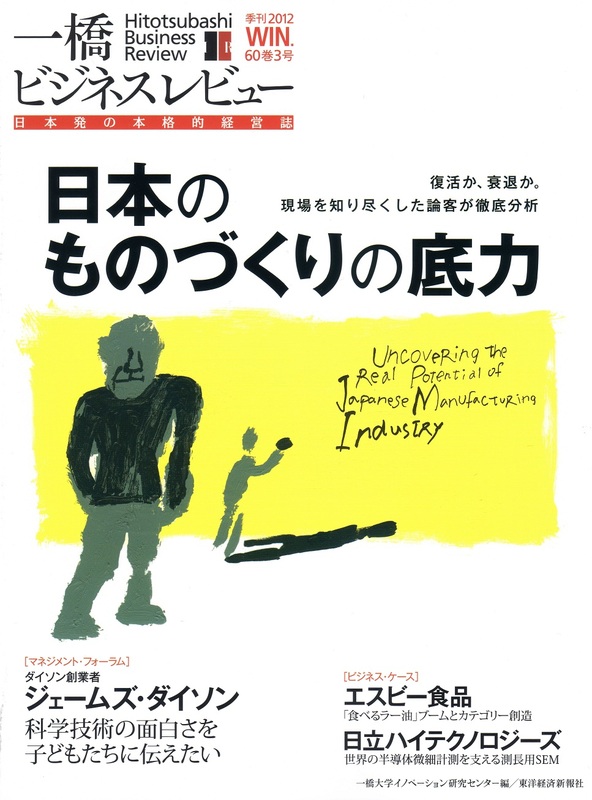 "Japan's Manufacturing Sites (Monozukuri Genba): The Darkest Hour before the Dawn?" "Import of Industrial Goods and Real Local Procurement in Overseas Production of Japanese Companies"
Lessons from the Japanese Economy in the 1990s"
Inter-Process “Flow” Concept of Sanji Muto"
"Growing SME Manufacturers’ Common Perception in East Asia"
"Difficulties in Creating Value at Japanese Firms Due to Managerial Complexity"
"Dynamic Fractal Organizations for Promoting Knowledge-based Transformation"
It is with great pleasure that I welcome you to our recently updated website. The Hitotsubashi University Institute of Innovation Research was created in 1997 as the first organization in Japan to research innovation from the viewpoint of the social sciences. Since then, the expectations placed on us have grown larger with each passing year, and today we are keenly aware of the importance of our responsibilities. Contemporary society demands innovation. Financial problems related to corporate management and industrial policy, challenges such as social issues that are rocking the foundations of people’s lives, and environmental problems that could radically affect the very continuation of the earth as we know it, are all problems that will only grow dramatically worse if we continue to do things as we have in years past. Innovation is the process of not remaining content with existing conditions, but rather assimilating new approaches, techniques and ideas to create even greater values society will find useful. Society must produce innovations not only in technologies and products, but in the social mechanisms that underpin the economy and markets as well. One defining aspect of individuals and organizations is a dislike of change. Overcoming this characteristic enables us to begin to discover significant new value. Innovation therefore requires first and foremost “mechanisms” to create the waves of change. At the same time, it calls for creating new value that goes beyond what we have seen in the past. A creative “venue” can play a major role in this regard. By studying the mechanisms that create such waves of change, and the best practices of such creative venues, the Hitotsubashi University Institute of Innovation Research is helping to invigorate innovation around the world. To achieve such a major contribution we not only are conducting superior research, but also working to forge mechanisms aimed at establishing a hub of global innovation research in Japan. Above all else, our objective is to play a leading role in the creation of waves of change and creative venues within an open environment. With that goal in mind, our hope is to be able to work in collaboration with many of you who visit our website. We will be pleased if you think to access the institute’s website first whenever you have such an opportunity. "Logic behind Open Innovation: Technology, Market and Organization"
"Open Innovation: Mechanisms and Challenges for Success"
"Open Innovation Management: Exploration for New Combination and Knowledge Management"
"Using Open Innovation to Leverage Japan’s Strengths"
"Salaried Entrepreneurs and the Internalization of Technology Market: A Case Study on Open Innovation by Osaka Gas "
"Development and Industrialization through Collaboration: Case of Dyneema"
"AJINOMOTO: the Entry into a BOP Market Targeting for Nutrition Improvement"
"A Case Study on the Commercialization of User Innovation: Kamoi Kakoshi "
Where Will Accounting in Japan Head for? Kunio Ito／Tetsuyuki Kagaya／Tomohiro Suzuki "New Challenges to Accounting Revolution: Beyond the Relevance Lost"
Kazuhiko Toyama "Crisis and Challenges of Corporate Governance in Japan"
Tetsuyuki Kagaya "Has the Convergence to the IFRS Affected Investment Behavior? : International Evidences"
Hajime Yasui／Yoshiyuki Kure "The Sustainable Value Creation Based on the Integrated Reporting"
Yoshinao Kozuma "Mandatory CSR Reporting by Companies: Probable Choice for the Future"
Tomonori Ito "Cross-border M&A by Japanese Companies: 10 Lessons from Japan Tobacco's Experience"
Kenshu Kikuzawa ／Ikujiro Nonaka "Economics of Knowledge-based Firms: Efficiency of Middle-Up-Down Management and Hypertext Organization "
As its name indicates, the project places its emphasis on visiting corporate worksites and conducting research based upon an in-depth understanding of the realities of technology development and enterprise management from a “microeconomics point of view,” a characteristic that sets the program apart from the many other research endeavors that focus on environmental and energy problems. As a result of the Great East Japan Earthquake, Japan currently is grappling with three serious and contradictory problems concerning the environment (reduction of greenhouse gases), energy (stable supply of electric power while eliminating nuclear power plants) and economic stagnation (Japan’s prolonged sluggish growth). To simultaneously solve these three problems, Japanese firms not only must create new industries related to the environment and new forms of energy, they also must be able to stably create added value in those new industries (see diagram at right). Many current environment and energy policies have disregarded this point. When viewed as a “solution to environmental problems” or a “solution to energy issues,” such policies are difficult to oppose and substantial tax funds are invested. If a scenario in which corporate activities are invigorated, added value is created by firms and economic growth ensues cannot be drawn as a result, however, the effects from investing taxes will be short-lived and limited (and tax funds are likely to be wasted). One reason conventional environmental and energy policies do not necessarily achieve significant results is thought to be the fact such policies lack an understanding of the realities of actual corporate management, market competition and technology development. In fact, it is not government that will promote the development of environmental and energy industries, it is firms exposed to international competition, and that means working individuals. Without an understanding of the realities of competition, technology trends, managers’ intentions and consumers’ preferences, enacting appropriate policies is impossible. It is believed that until now, scholars of business have been little involved with environmental and energy policy. Hitotsubashi University has nevertheless launched this project, however, because of its awareness of issues like those described above. ・Chuma, Hiroyuki, “Searching for the Characteristics of R&D Strategies in the Semiconductor Industry: From a Network Analysis Viewpoint,” Economic Research, Vol. 62, No. 3, pp. 225-240, July 2011. ・Chuma, Hiroyuki, “Searching for Main Causes of Declining International Competitiveness in Scientific Industries: Example of the Semiconductor Industry,” published in Fujita, Masahisa and Sadao Nagaoka, eds., Productivity and Innovation Systems (2011), Chapter 7, pp. 317-360. 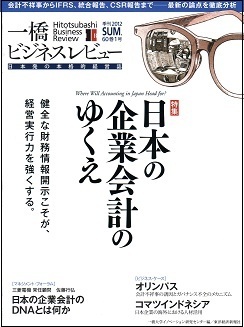 ・Nakaya, Masao, 2011/03/17, “Analysis of Semiconductor Industry Profitability: Substantive Analysis of Semiconductor Firm Panel Data,” IIR Working Paper WP#11-03, Hitotsubashi University Institute of Innovation Research. ・Kameyama, Masaomi, 2010/09/10, “Lithography and the ITRS,” IIR Working Paper WP#10-06, Hitotsubashi University Institute of Innovation Research. The Third Asia-Pacific Innovation Conference will be held at Seoul National University, Korea on Saturday 13 and Sunday 14 October 2012. National University of Singapore together with Hitotsubashi University is pleased to host the Second Asia-Pacific Innovation Conference, in collaboration with a　consortium of the universities and other academic institutions, the WIPO (World Intellectual Property Organization) and RIETI (the Research Institute of Economy, Trade and Industry). The conference will bring together scholars, including doctoral students, working on the economics, management and law of innovation. It will foster an inter-disciplinary exchange of knowledge. Sessions will include contributed papers, keynote presentations and panel discussions. 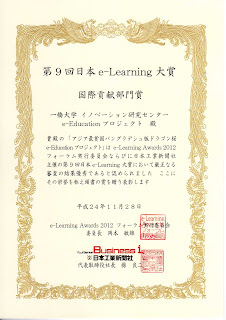 -The conference will be held in English. 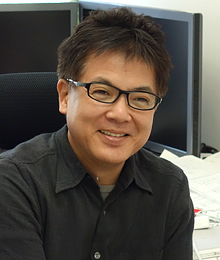 Speakers: Yamada Ei, President and CEO / Suzuki Fumihiko, Director, Corporate Planning Dept.